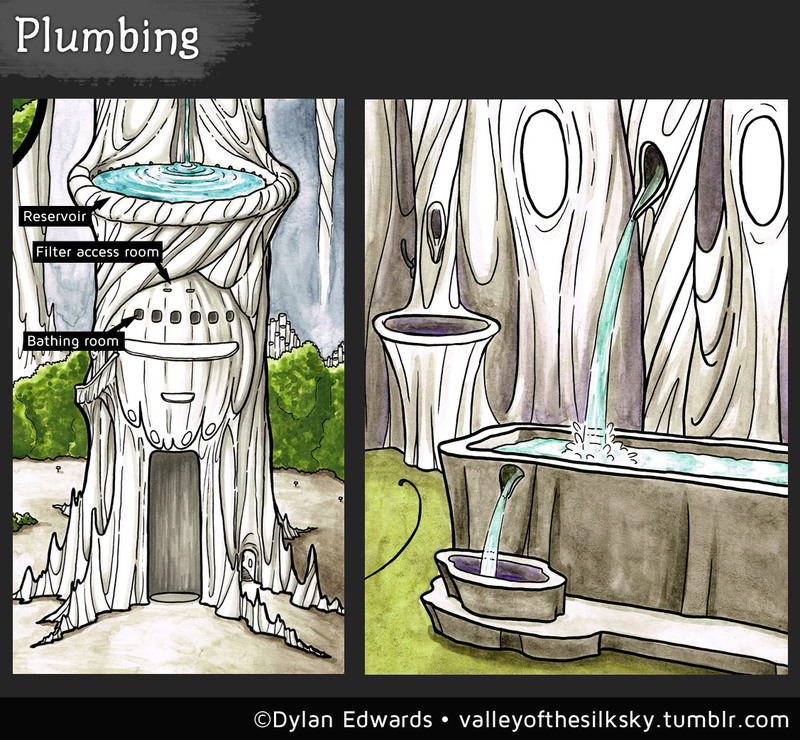 I know what you’re wondering: how the heck does plumbing work in this weird world? While there are a few different means of collecting and distributing water in the Valley, let’s focus on the one most relevant to the main comic: the plumbing of the Cashel Waystation. which is located in the interior of the province of Muru. The Cashel Waystation receives most of its water via a large pipe from the provinces above (who get their water mostly from rainfall and snowmelt), and holds it in a reservoir. Technically yes, BUT. At the bottom of the reservoir is a filtration system, accessed via the topmost room of the main building, where those two little slit windows are. One of the many duties of the waystation attendant is maintaining that filtration system so the water stays clean. The bath is left running all the time to provide some humidity to the air, and to keep the water flow going to the provinces below. Gravity provides the water pressure. Drinking water is filtered more thoroughly and piped separately from bathing water or toilet water. The Cashel Waystation has pit toilets that use only a tiny amount of water to flush waste down a pipe leading to Eradu, the province directly below. Eradu is nicknamed The Swamp for various reasons, of which this is one. It tends to be the last stop for a lot of the waste from the provinces above. Correct! They do not. Which is why most people who live in Eradu actually live on the hillsides around the edges of the Valley, and not inside the web structure of Pocalo itself. Humans mostly try to avoid venturing into The Swamp itself if they can.